This New York Times bestseller is an exciting and fearless investigation of language from the author of Better Angels of Our Nature and The Sense of Style and Enlightenment Now. "Curious, inventive, fearless, naughty." --The New York Times Book Review Bestselling author Steven Pinker possesses that rare combination of scientific aptitude and verbal eloquence that enables him to provide lucid explanations of deep and powerful ideas. His previous books - including the Pulitzer Prize finalist The Blank Slate - have catapulted him into the limelight as one of today's most important popular science writers. In The Stuff of Thought, Pinker presents a fascinating look at how our words explain our nature. Considering scientific questions with examples from everyday life, The Stuff of Thought is a brilliantly crafted and highly readable work that will appeal to fans of everything from The Selfish Gene and Blink to Eats, Shoots & Leaves. "Engaging and provocative...filled with humor and fun." "Pinker is a star, and the world of science is lucky to have him." "An important and inviting book." "There's plenty of stuff to think about, but a lot of fun stuff too." 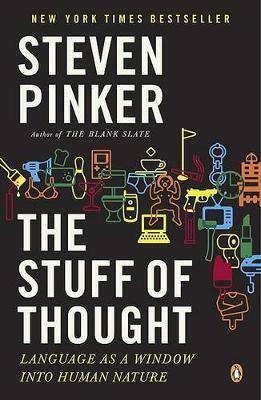 -Douglas Hofstadter, Los Angeles Times "Pinker is a star, and the world of science is lucky to have him." --Richard Dawkins "Curious, inventive, fearless, naughty." -New York Times Book Review "An important and inviting book." --Science "There's plenty of stuff to think about, but a lot of fun stuff too." Wired "Unfailingly engaging to read." Steven Pinker is the Johnstone Family professor of Psychology and Harvard College Professor of Psychology at Harvard University. A two-time Pulitzer Prize finalist and the winner of many awards for his research, teaching, and books, he has been named one of Time's 100 Most Influential People in the World Today and Foreign Policy's 100 Global Thinkers. His other books include The Better Angels of our Nature and The Blank Slate.